When we think of great places to work we often picture a lush sprawling campus, with fun toys, luxurious amenities, a place where employee happiness abounds. But many of these assumptions and imaginings are not true. As human beings we have a full range of emotion and denying a large number of those emotions by labelling them “negative” can be destructive. We can’t always be happy. In fact when we try to remain exclusively in a happy state (ignoring any “negative feelings”) we go quickly into denial and it causes more stress and lower engagement scores at work. Happiness research over the last 10 years has shown that people in a good mood are more sociable, altruistic and even more creative. Many organisations have tried to benefit from these findings by trying to boost employee happiness. This is great news for the workplace as organisations who care about their employees are preferable to those that don’t. Happiness also has a potential dark side as sometime when are feeling euphoric we can be less careful, a little more gullible and less risk adverse. This means workplace happiness can sometimes be counterproductive. Studies also show that “negative” emotions (anger, embarrassment, and shame) can sometimes increase engagement by directing our attention to serious issues and prompting us to make corrections that are likely to increase our chances of success. Ignoring issues and “playing happy” leads to more conflict and stress. 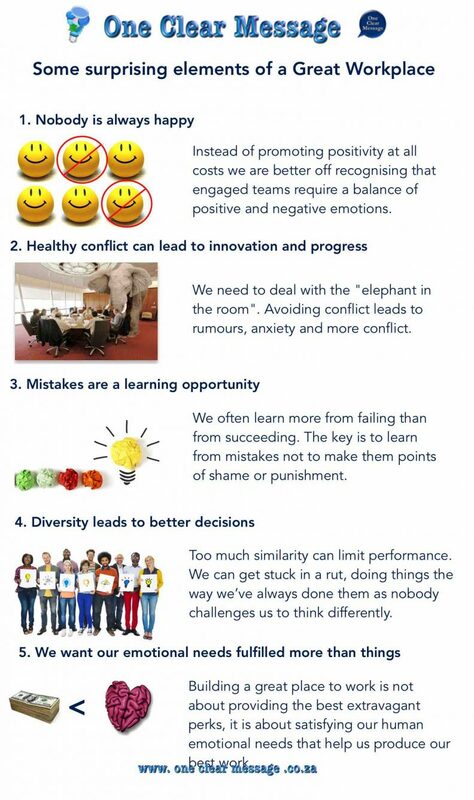 Instead of promoting positivity at all costs we are better off recognising that engaged teams require a balance of positive and negative emotions. Pushing employees to ignore or suppress negative emotions is a recipe for alienation, not engagement. Relationship conflicts- personality clashes or differences in values. Relationship conflict can be the most damaging if not handled effectively. Managing relationship conflict requires Emotional Intelligence and honest communication. Task conflicts – disagreements on how work is performed. The research shows that task conflicts managed well are likely to help produce better decisions and stronger financial outcomes. Well managed healthy debate clears up misunderstandings, gives people voice and increases buy-in. Encouraging feedback and healthy debate helps team members to more effectively evaluate alternatives and avoid premature consensus. Though conflict can be initially uncomfortable open dialogue can energises employees by clearing up misunderstandings and by providing better strategies for doing their jobs. Workplaces that avoid disagreements in an effort to maintain group harmony are doing themselves a disservice by keeping issues hidden. As children when learning to walk we fall, we make mistakes and we develop the skill of walking. Unfortunately many of us avoid failure and the potential to learn and grow to avoid embarrassment and in a misguided effort to appear perfect. When we are unwilling to fail we tend to remain static and don’t grow. 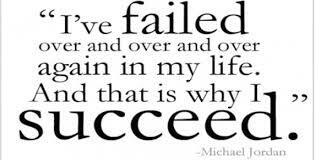 We often learn more from failing than from succeeding. The key is to learn from mistakes not to make them points of shame or punishment. Imagine you have been hired to manage 2 teams. Before you start you get a performance report summarising for the last 12 months. One statistic stands out: on average, Team 1 reports 5 mistakes. Team 2 reports 10. Which team is the more effective team? Many feel it is obvious that Team 1 is better as they make fewer mistakes. Amy Edmondson of Harvard looked at the performance of nursing units at a university hospital (1990). Contrary to her expectations that units with the best managers and coworker relationships had the fewest drug treatment errors she found the opposite. the study showed nursing units with better nurse-manager relationships reported substantially more drug treatment errors. this wasn’t because they were less effective but because they were more comfortable admitting mistakes when they happened. 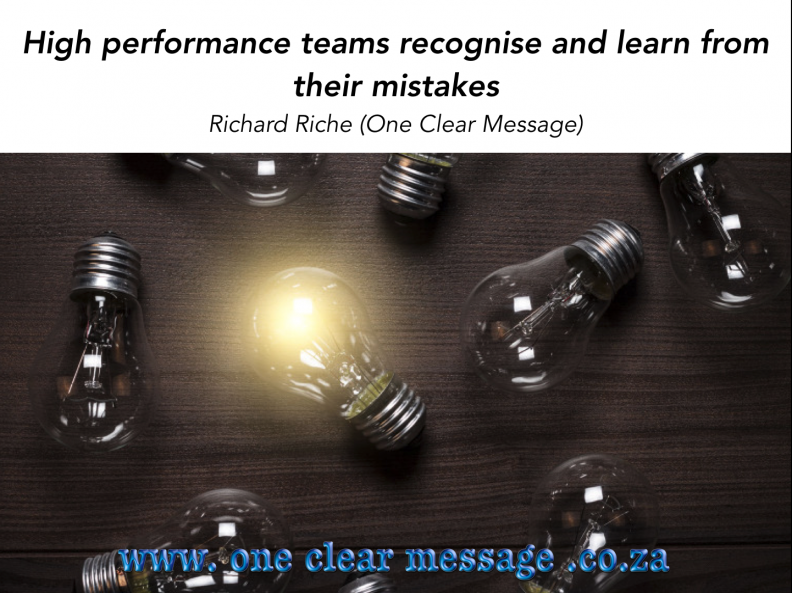 High performance teams recognise and learn from their mistakes. To learn from our mistakes we need to develop a growth mindset where improvement rather than perfection is the primary objective, instead of treating mistakes as a negative consequence to be avoided at all costs (making employees reluctant to acknowledge them). It is easy to fall into the trap that when employees share similar attitudes they are more likely to get along, and more likely they are to produce. This is not necessarily true. Too much similarity can limit performance. Too much similarity can encourage complacency. We can get stuck in a rut, doing things the way we’ve always done them as nobody challenges us to think differently. Similarity can also lead to overconfidence in the accuracy of our opinions and cause us to invest less effort in our decisions – potentially leading to more errors. In a study where teams of 3 where asked to solve a problems with the help of a new colleague (similar/dissimilar) the diverse teams performed the best, though the similar teams felt more confident in their decisions. In the dissimilar teams members were challenged by new members to reexamine their assumptions and process data more carefully, while in the similar teams this wasn’t done. A homogenous workforce has its advantages when task are repetitive, but when innovation, creativity and knowledge work are the focus a diverse team is more effective. The key is to encourage healthy task conflict. Exposing people to different viewpoints can generate more value than ensuring they remain in harmony. It is easy to assume by the number of times great organisations lavish benefits are mentioned in the media that it is these things that create a great workplace. e.g. a rock-climbing wall (Twitter) or volleyball courts with complete with actual sand (Google). The research shows that we don’t need these luxuries (as nice as they are). What we need is human experiences that fulfil our basic human needs. Decades of academic research shows we perform at our best when we feel autonomous, acknowledged and connected to others. Building a great place to work is not about providing the best extravagant perks, it is about satisfying our human emotional needs and developing working conditions that help us produce our best work. A great workplace is not a perfect workplace. Great places to work have a learning, people centred mindset that leads to great retention and Employee Engagement. Richard specialises in helping you build real human communication skills. 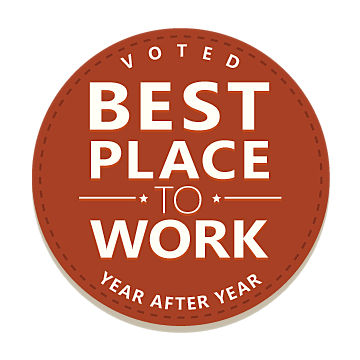 Employee Engagement / Experience, Emotional Intelligence skills, building high performance teams and a great place you want to work. TED style speaking and presentation skills. Training, consulting and coaching. Scrap annual rated performance reviews – then what?